Beets, you either love ‘em, or you hate ‘em right? Beet lovers often credit the earthy flavor and aroma as appealing. And for that very same reason, many people downright refuse to eat beets. Because to them, “earthy” tastes a lot like DIRT. Ever drink a Sprite? I’m with the latter group. However, after reading about all the significant health benefits of Beet Kvass, and a good long hiatus (20+ years) from eating beets, I decided to give them another try. That is why I came up with a Beet Kvass recipe you will actually want to drink. Apples, oranges, and strawberries are all good choices when making a beet kvass drink taste great. Beet Kvass is an excellent blood tonic that promotes regularity, aids indigestion, alkalizes the blood, and cleanses the liver. With benefits like that, it’s it worth it to try a variety of recipes to find one you enjoy? In the recipe I’m sharing today, I added one cup of chopped apples. Other fruit options to consider are strawberries, orange juice, carrots, pineapples, lavender, fresh or dried mint leaves, raisins, ginger and/or cinnamon. But, don’t stop there, get creative and add fruits that are local to your area. You can even double up on the fruit. The secret is in the fruit. This is how I hide the dirt (earthy) taste and can wholeheartedly call it a Beet Kvass recipe you will actually want to drink! After the Beet Kvass is ready to drink, pour it over some ice and mix in a little orange or apple juice to make it even more delicious. Start out with a 50/50 mix and then lessen the fruit juice amount until you come to a satisfying mixture that is right for you. ¼ cup whey or juice from sauerkraut – this is optional so don’t worry if you don’t have any. Optional: to sweeten the recipe consider adding raisins, strawberries, orange juice, carrots, pineapple, lavender, fresh or dried mint leaves, or cinnamon. Weigh the beets down with a rock, pickling weights or a leaf of cabbage rolled up. Cover tightly and shake well to ensure the salt is fully dissolved. Burp the jar periodically, otherwise, carbon dioxide levels can build up and create pressure. Check the metal lid every day, if you can’t push it down than unscrew the lid a bit and then immediately tighten it back down. Before drinking the beet kvass, smell it and look at it, if it looks bad or has mold growing in or on it then throw it out and start over. Fermentation can sometimes go wrong, so be safe! If the beet kvass smells sweet and earthy it is safe to drink. When the beet kvass is fermented to your taste, strain the liquid into jars and label them. Beet kvass can be stored in the fridge for up to three months. Why fermented foods are so good for you. 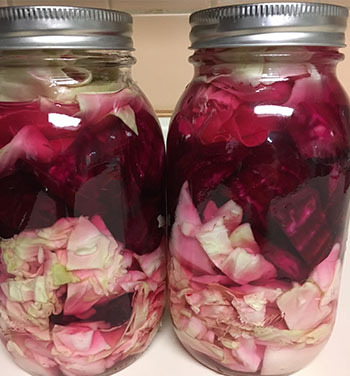 Fermented foods are full of gut-healthy probiotics and beets are considered one of the most nutrient-rich vegetables available. During the fermentation process, the sugar is eaten up by the good bacteria (probiotics) turning it into a low sugar food while leaving the healthy stuff, antioxidants, fiber, vitamins, and minerals still intact. Beet Kvass is full of beneficial enzymes, probiotic bacteria, and higher levels of vitamins. Making it a superfood. There are many studies on how probiotics help balance the bacteria in your gut and contribute to a healthier mental, emotional, and physical state. Many athletes drink beet juice before a workout because of its nitric oxide-boosting benefits which can boost stamina by up to 16%. Beet juice including beet kvass improves stamina by up to 16%. Beets have a high amount of a natural chemical called phytonutrients, which is common in many fruits and vegetables. It protects them from germs, fungi, bugs, and other threats. The phytonutrients contain powerful anti-cancer properties. When you eat or drink phytonutrients, they may help fight diseases such as pancreatitis, breast and prostate cancer. Beets have high levels of nitrate; which in your body is converters into nitric oxides which helps naturally lower blood pressure. Get the science nitty gritty here. There is no denying the fact that beets either fermented or raw have quite a number of beneficial effects. But there are several drawbacks as well. If you are prone to kidney stones, it is recommended to avoid beets, along with spinach, Swiss chard, rhubarb, okra and more. Beets have a high level of oxalate. The oxalates can cause crystallization and make a person who already has kidney stones produce even more. The high levels of oxalate can also contribute to gout, a type of arthritis that develops when too much uric acid builds up in the body. Excessive consumption of beets may result in beeturia in some people. Beeturia is a condition where your urine may appear pink or red. Don’t be alarmed because it’s not blood and is actually harmless. With all things, moderation is the key. It is important to note that all of these side effects generally occur when someone is consuming a large amount of beets, beet supplements, or beet juice. If you are feeling any side effects consult a doctor and immediately stop eating or drinking beets. To learn more about the benefits and side effects associated with beets both raw and fermented visit the following links. Beets are especially beneficial to women during pregnancy: vitamin B and iron are beneficial to new growth cells during pregnancy and replenishing iron in the woman’s body. Beets are rich in Potassium, Magnesium, Fiber, Phosphorus, Iron, Vitamins A, B & C, Beta-carotene, and Folic acid. Beet kvass gives a real electrolyte boost which can help support you when feeling tired or overwhelmed with morning sickness. It’s also more hydrating than water like many lacto-fermented drinks. This comes in handy during the breastfeeding stages of raising your baby. They also offer support for the blood and liver thanks to the betacyanin in the beets. The high levels of folate and folic acid in the beets and the probiotic qualities make this a perfect drink for pregnant women. Despite the numerous health benefits, there are a few side effects of beets during pregnancy that you should be aware of. One compound in beetroot that causes concern for its use in pregnancy is betaine which can cause symptoms such as vomiting, nausea, diarrhea, and other gastrointestinal problems during pregnancy. According to studies (here), betaine has shown negative effects in animal testing. However, there are no clear studies on pregnant women to support its safety. Beets are naturally high in nitrates which can make you feel weak when pregnant. Its common knowledge that deli meats, bacon, sausages, and some hot dogs are high in nitrates and nitrites. But, there are also many vegetables high in nitrates too, including lettuce, beets, carrots, green beans, spinach, parsley, cabbage, radishes, celery, and collard greens. Researchers believe the benefits of eating more nitrate-rich vegetables, such as beets probably outweigh the risks, as these nitrate-rich foods can lower your risk of cardiovascular disease. ** With that being said, it is always wise to consult your doctor first about what is a safe amount of beets to consume during pregnancy. How much beet kvass should I drink? Start out slowly with one or two teaspoons and gradually working your way up from there. Again, moderation is the key. I enjoy about a half a glass in the morning and the same at night. Accidents happen, but they don’t have to ruin your clothes. We all know that beet juice can leave a nasty looking purple stain. So here are a few quick tips I’ve compiled on how to remove beet juice stains from your clothes.